There is many good things about Christmas in Dubai. If you can get your head around sunshine, blue skies and rather warm weather (which is something you have to get used to when you grew up in more Northern regions of the world), the rest is just mind-blowingly good. The city is quiet, as many expatriates have left to their home country for Christmas and New Year. The weather is actually really good: just in the middle between the hot summers that last for an eternity and the coldest time of the year which usually hits in January and February. The good weather serves very well for another thing: outdoor running. No longer do you have to run at crazy early or late hours to avoid the heat of the sun. And now the best: Christmas coincides with the toughest part of marathon training for the Dubai Marathon on 25 January. The longest long runs are to be done during this time of the year. Last week I did a 29k run among a weekly mileage of 70+km. Yesterday I ran 32k. For next week, the longest long run of 35k is on the schedule. This high mileage translates into higher energy needs. Which is well timed, as Christmas sweets and treats are available everywhere. And I can dig in without any guilty feelings!! Anything that looks like cookie, square, bar or cake will not be safe from me these days. My hunger pangs after a long run trickle slowly through the day. Little bits and bites are my favorite foods. Today's Pumpkin Orange Spice Squares I ate all by myself. Not in one day, but it surely didn't take much longer than that. The spices and orange zest give it that Christmas-sy flavor. The lemon icing on top gives it extra zing that I wouldn't want to miss. 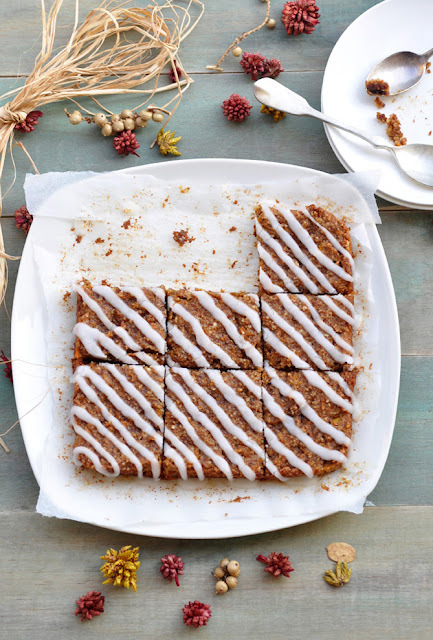 These squares serve all the purposes: a vegan Christmas treat and marathon fuel at the same time. Enjoy! Preheat oven to 180C. Line 20cm square tin with parchment paper. In a small bowl, combine flax meal with water and whisk until well combined. Let stand for at least 15 minutes, or up to an hour. In a large bowl, combine almond meal baking powder and spices. Set aside. In another bowl, whisk sugar and coconut oil until fluffy. Add the flax water mixture and whisk again. Stir in orange zest and orange juice. Add wet to dry ingredients and stir until just combined. Fold in grated pumpkin. Transfer batter to prepared square tin. Bake for 30-40 minutes or until cake tester comes out clean. Let cool completely on wire rack. In a coffee or spice grinder, pulse the raw sugar until it has the consistency of powdered sugar. Transfer to bowl. Add 1 tablespoon of lemon juice and stir until the mixture becomes a thick liquid. Use more lemon juice to if the mixture is too thick, and more powdered sugar if's too runny. Drizzle over the cake and let harden before serving.